The following blog was originally published on August 30, 2017 on the Children & Nature Network's website. It was written by Jarrett Jones, a CityYear Chicago alumni and National Council Of Young Leaders council member. Jarrett is also a Fresh Tracks leader. Read more about Jarrett's involvement with Fresh Tracks here. My name is Jarrett Jones and I would first like to thank you all for taking the time to read my story about one of my first real encounters with nature. I’m a 25-year-old black man from Chicago. Growing up on Chicago’s Southside, I can’t say I was ever truly exposed to ‘nature.’ Of course, as a kid, I visited neighborhood parks and experienced the resident wildlife and nature there. But that was really the extent of it. My understanding of nature as a kid mainly came from Chicago’s Marquette Park. 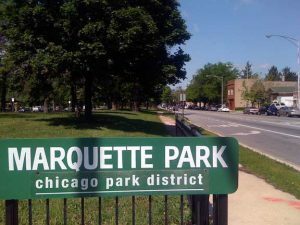 Marquette had a playground, soccer fields, tennis and basketball courts. It also had a lagoon, though I was never really a fan of the types of insects I found there. For some reason, lightning bugs and the way they naturally illuminated the darkness of the night fascinated me. To me, this was nature. Once I turned twelve, things quickly changed for me. Almost a teen, I became more aware of the social norms prevalent in my community. Those norms included gangs, violence, drugs, etc. These norms took control of my life over the next seven years, drawing me away from what I knew as nature…until I reached a breaking point. When I was 19 years old, I made the decision to no longer accept the negative social norms that had taken over my life. Nor would I accept the negative stigmas placed upon me and other young black men. Since that decision, I have gone on to work for three different law firms, one multi-billion-dollar corporation and one international educational non-profit. I am the only child of our three-child family who has obtained a high school diploma. My year with the council has involved traveling to conferences, summits, and events to speak about opportunity youth. We collaborate and strategize with organizations like Starbucks that participate in “The 100,000 Opportunities Initiative,” the country’s largest employer-led coalition committed to creating pathways to meaningful employment for young people. We speak with high-level executives about ways their companies can provide opportunities for young people who face unique challenges, but possess a source of tremendous talent and potential that goes untapped. While traveling and speaking with key stakeholders, we always make time to connect with the youth that we are representing. In fact, one of the most powerful aspects of our work is the events we host or attend with local youth organizations to facilitate trainings on how to engage political systems, power and responsibility when using voice and telling personal narratives. Earlier this summer, I received an invitation to attend the Natural Leaders and Fresh Tracks Trainer Summit. I jumped at the opportunity to be of service and was anxious to learn from others. The first day of the camp, while getting to know everyone, I quickly noticed that I was one of the oldest participants attending. At first, it made me question my decision about coming to the camp. I was skeptical that some of the other younger leaders could teach me as much as I could teach them. But boy was I wrong. The summit was transformative for me on so many levels. But it was a personal experience with nature that left the greatest impression on me. 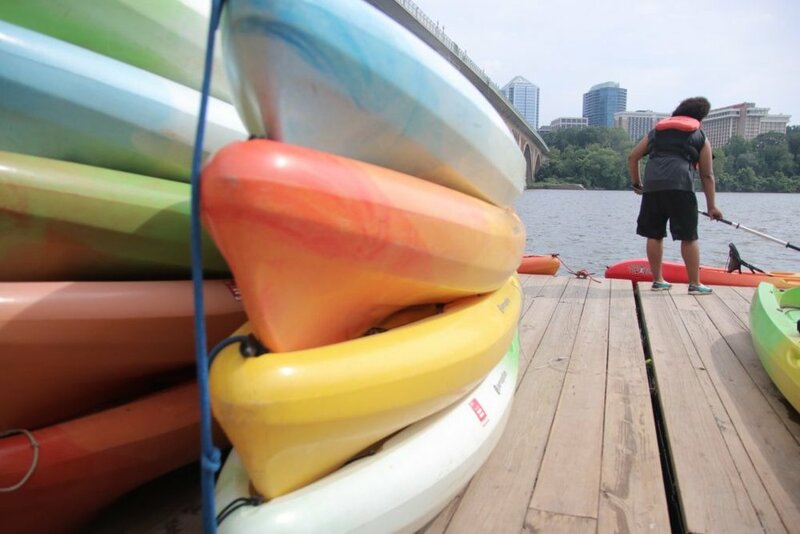 A leader from Denver challenged me to take on one my biggest fears during a planned kayaking trip: large bodies of water. From early childhood to my late teens I have had bad experiences when it comes to water-related activities. Let’s just say that after being saved three times and resuscitated twice by a lifeguard, I have a respectable fear of large bodies of water. This leader didn’t care much about that. During the bus ride to the Potomac River, she encouraged me to face my fears. Naturally, after she initiated the challenge, I said “absolutely not” in my head. I had almost died twice. Why give death another chance? When we arrived at the river, she continued to push and challenge me. At that point, I had to put on a brave face and just do it. I was beyond scared for the first five minutes because I couldn’t think about anything except my past near-death experiences. For reasons I can’t quite explain, I suddenly became present in the moment. I focused on the sunlight hitting my skin, the soft breeze, and what seemed like an endless number of trees. At that very moment, I was at peace. I can honestly say I haven’t been at that level of peace in an extremely long time, if ever. Being a 6’3” young black man from Chicago, I don’t often have the luxury of being at peace. I could be navigating neighborhoods trying not to be the next victim of gun violence, working hard to prove I’m just as smart, capable, and competent as my white counterparts, or just making sure I’m not doing anything to warrant an encounter with the police. So, that moment, as well as the two hours we spent kayaking, was everything to me. Looking back on the experience, without the encouragement of the young leader from Denver, I would have let something as minuscule as fear rob me of a life-changing experience. An experience that not only rejuvenated me with hope, inspiration, and peace but also allowed me to re-energize and continue to create a change for struggles my community faces at home in Chicago. Learn more about the Natural Leaders Network here.